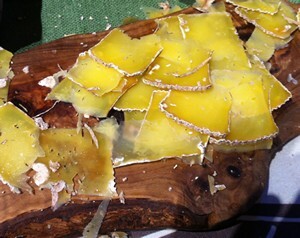 If you ever needed an excuse to eat cheese, the Vermont Cheesemaker’s Festival is your perfect pretext! For the Accidental Locavore, or any cheesehead, it’s like going to an all-you-can-eat night at your favorite (really good) fromagerie. 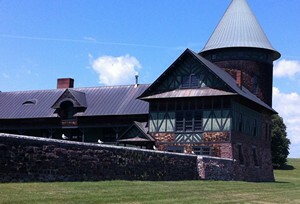 Held on the beautiful grounds of Shelburne Farms, it’s an all-day, all-you-can-eat, all-you-can-drink and all-you-can-carry-home extravaganza of local cheeses (and there are lots), local artisanal products and local alcoholic beverages on the banks of Lake Champlain. After a night at the hotel-from-hell (reminder for next year: book rooms way ahead of time), we hit the road and had a wonderful breakfast at Mirabelle’s Cafe in Burlington. Although the eggs Benedict were great, eating that much put us at a distinct disadvantage when we got to the festival (reminder #2: go hungry). There were over 80 exhibitors in the festival and 1750 spectators. Early in the day, access to all the tables was easy and the vendors had time to chat about their cheeses (reminder #3: go early). There seemed to be a preponderance of chèvre, not sure why (maybe it’s just because goats take up less room than cows) and early on it became apparent that people’s taste in cheese is as varied and personal as their taste in wine. My friend Betty, whose idea this jaunt was, was not impressed by stinky and/or really aged cheeses, while I snapped up all of the above! 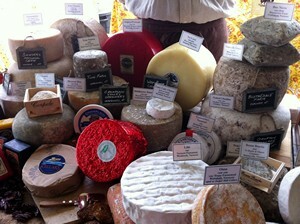 If there is a category of cheese that I can pass on, it’s usually what are referred to as the Alpine varieties. It’s most likely a textural thing, rather than a flavor issue. 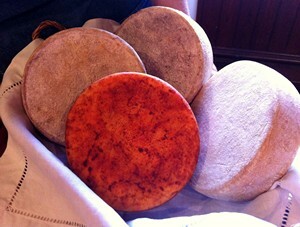 I just prefer my cheeses to be either very hard with flavor developed over time, or soft runny and assertive. Since we have no shortage of great cheese stores in Manhattan, I concentrated on buying (mostly) cheeses (and other stuff) that weren’t available in New York (reminder #4: have some sort of strategy for maneuvering the festival). So what made the bag home? In the non-cheese category, a jar of spicy maple pickled beets from Vermont Pickle, an addition to the line that was so new she hadn’t had a chance to get the labels made! Betty said they were amazing, so I brought a jar home for my husband. A stick of pepperoni from Vermont Smoke and Cure. I grabbed a bite on the fly (being a typical New Yorker and ignoring the long line), it was great, spicy and smoky, so that made the bag. On the cheese front, my favorite Vermont cheese, the Cabot Clothbound Cheddar (yeah, I can get it at Murray’s and do, but it was a lot cheaper at the show/source) and while I was at the Jasper Hill’s table, a wheel of their Harbison (the runniest cheese I brought home). A couple of aged goat cheeses from Twig Farm (aptly named “Old Goat”) and Willow Moon Farm and my little cooler bag was full (reminder #5: bring a bigger cooler bag and ice packs). The other two things I would do differently next year would be maybe to take notes on what I was tasting. There were lots of great cheeses we had that I can probably get here, but the challenge will be remembering what they were! Also, to warm up my taste buds, stopping on the way up there at some of the pre-festival open houses like the one we were invited to at Vermont Butter and Cheese (thanks Hillary!) would be a chance to visit some of the cheesemakers in a more relaxed setting. Want to join me? I love cheese Anne. This sounds like a fabulous event. I’m coming to Boston in November so I’ll keep an eye out in the deli’s for some of these!